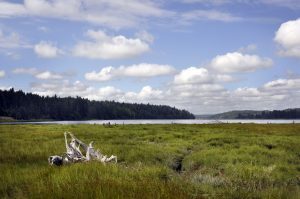 Capitol Land Trust (CLT) and our many partners play a key role in protecting natural marine shorelines of Puget Sound by identifying productive and sensitive habitats, and by working with willing landowners to protect these areas using methods such as purchase, conservation easements, and restoration. We strive to maintain our shoreline heritage so that future generations will also be able to enjoy a meal of fresh salmon and shellfish, a day of clam digging and beachcombing, and see a great blue heron stalking fish along the water line, or glimpse an otter scampering down the beach. Our extensive marine shorelines are a special feature of the southern end of Puget Sound. They formed when, during past ice ages, huge glaciers from the north plowed through lowlands between the Cascade and Olympic mountains, carving out a series of narrow fiords (inlets) separated by higher peninsulas. When the glaciers retreated, the low areas were connected with the Pacific Ocean, creating the complex of inlets and marine shorelines we see today. Our shorelines provide inspiring views of glistening mountains across sparkling water. We enjoy and share many recreational and educational pursuits such as clam digging, fishing, crabbing, boating, bird watching, beach combing, and nature study made possible by access to shorelines and beaches. Twin Rivers Ranch Preserve on Oakland Bay in Mason County. Photo by Bonnie Liberty. Natural shorelines consist of beaches of sand and gravel, which are replenished by erosion of adjacent banks and bluffs. These beaches provide spawning habitat for small fish such as surf smelt, sand lance, and herring. They also provide productive habitat for shellfish such as littleneck clams and Olympia oysters, as well as other intertidal organisms like sand dollars and moon snails. Steep banks and high bluffs adjacent to the water provide habitat for kingfishers and pigeon guillemots that nest in burrows in the bluffs. Trees leaning out from the shoreline provide cover for fish and perching sites for kingfishers, bald eagles, and crows. Near-shore waters adjacent to the shoreline are used by salmon, sea-run cutthroat trout, and seals, as well as diving ducks such as goldeneyes and buffleheads while they over-winter in Puget Sound. In estuaries, fresh water from rivers and streams mix with salt water, producing a rich environment for fish and wildlife. Estuaries range in size from small coves or “pocket estuaries” like Allison Springs, where CLT has done extensive restoration, to those associated with large rivers and streams, like the Nisqually River. Regardless of size, estuaries and their associated salt marsh and mudflat habitats are important rearing areas for young salmon leaving our rivers and streams. Here they acclimate to salt water and put on rapid growth, feeding in the rich salt marsh sloughs and shallow waters. Estuaries are also important stopovers for shorebirds on their migrations, where they rest and feed on invertebrates to replenish the fat that will fuel their long flights to northern breeding areas in the spring, and back south in the fall. The abundant fish and shellfish available in our inlets were key to supporting Native American communities along the shores of Puget Sound, and the linkage between salmon, shellfish, and Native American culture remains strong today. The shellfish and salmon were also a foundation for the economy of the pioneers and settlers. Totten and Little Skookum Inlets, and Oakland Bay are still some of the most productive shellfish-producing areas in the country. Our shorelines provide many important ecological, economic, social and aesthetic values. 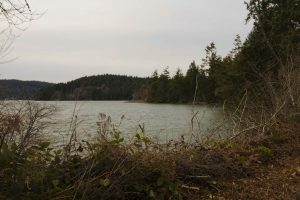 Triple Creek Farm Conservation Easement on Eld Inlet. Photo by Capitol Land Trust. Ecologically, shorelines provide diverse habitats, including estuaries, mudflats, and beaches. These are dynamic places, where the land meets and interacts with the sea. Our attraction to the many wonders of shorelines can also be a threat – we are in danger of loving them too much. Shoreline home sites are highly valued because of the beautiful views, natural setting, and ready access to the water. Consequently, many of our shorelines have been overtaken by residential development. The combined impacts of bulkheads, tree and native vegetation removal, and runoff from driveways and yards, can reduce and alter beach habitat. That is why Capitol Land Trust, with your help, has been protecting these vital places. While proper planning and stewardship can reduce the impact of development, it is critical to maintain natural areas with highly functioning habitat if we are to ensure shoreline health and productivity. We have protected over 14 miles of Puget Sound shoreline and continue to work with private landowners, public agencies and others to ensure we have shorelines abounding with life into the future. Text reprinted with permission from Capitol Land Trust News, issue 61, Spring/Summer 2016. In 2009, the Capitol Land Trust and Griffin Neighborhood Association formed the Steamboat Conservation Partnership. Since this collaboration took effect, we have been able to protect more than 300 acres in the Steamboat Peninsula region. Click here to learn more about this first-in-the-nation partnership between a neighborhood group and land trust.